The Happy Homebodies: My Best Thrifting Score Yet? I was at the thrift store a few weeks ago when I spotted two beautiful rugs. The first thing I did when I saw the rugs was look for the brand. 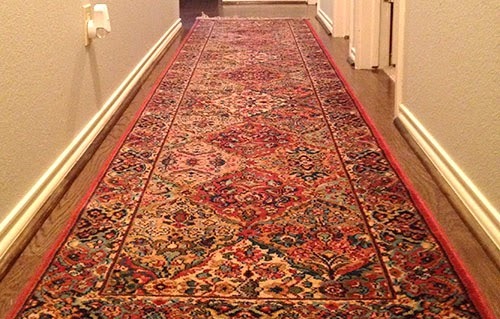 I was thrilled when I turned over the long runner and realized it was made by Karastan. I knew they were a trusted brand that makes high quality rugs, and I thought the colors woven into the rug were gorgeous together. I knew it was worth more than the $10 asking price, that’s for sure. 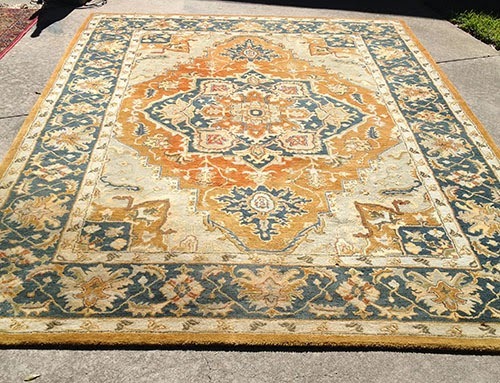 I was also interested in a large 8x10 rug with beautiful blue and gold tones, but the tag was partially ripped so I couldn’t see who made it. It looked luxurious and was made of 100% wool, so I figured it was decent quality. The 8x10 rug was only $20! 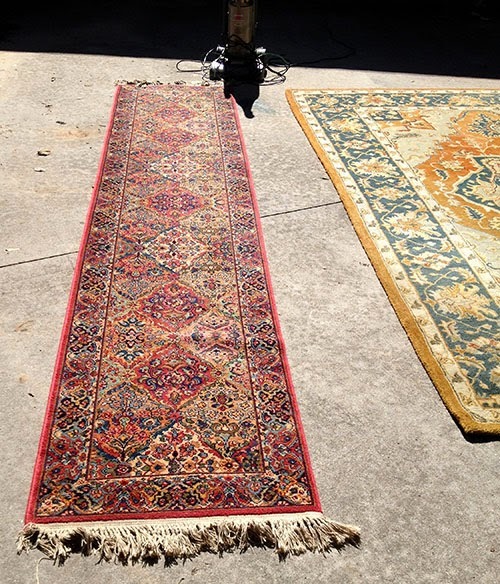 Before I was ready to pull the trigger on either of these rugs, I tried to execute the smell test. I crouched down to smell the rug, trying to detect any overwhelming odor from smoke or pets. I didn’t smell anything out of the ordinary, but I knew there might be an odor when we got it in our own home. Sometimes the smell of the entire store doesn’t allow you to really smell a specific item, so it’s a bit of a risk. The husband was with me at the store that day, so we were able to discuss whether or not we should buy the rugs. Because the prices were so low, we decided it was only a small risk. If the rugs had a yucky smell we couldn’t deal with, we wouldn’t be losing a big investment. We agreed to rent a carpet steamer to give the rugs a thorough cleaning, and we crossed our fingers that the rugs would be usable! Once I got home, I decided to search for the Karastan rug to see how much they cost normally. I found our exact runner selling online for $800! That made me feel pretty great about our $10 purchase. It was the perfect size for the hallway in what we call the “guest wing,” which is located on the opposite side of the house as our master bedroom and contains the three guest rooms. Shortly thereafter we decided to rent a carpet steam cleaner from our local Lowe’s for the day so we could clean the rugs. I shopped around for the best daily rate to rent a steam cleaner, but my research found that each place was about the same price (basically $25 for a 24-hour rental). I tried Lowe’s, Home Depot and our local grocery stores, and they were all within $2 of one another. Since Lowe’s is the closest one to our house, I went with them. I paid an extra $3 to rent the attachments for cleaning stairs and upholstery, figuring we could steam clean some of our thrift chairs while we were working on the rugs. Following the instructions on the steam cleaner, we cleaned our two new rugs outside in the driveway. Then we brought the steam cleaner inside to clean our two vintage brass recliners and our flea market accent chair. 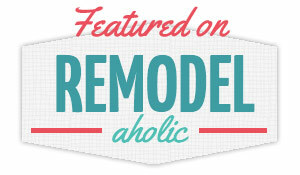 For good measure, we also cleaned our two area rugs that we had inside. Why not make the most of the rented steam cleaner, right? At this point we felt pretty confident about the Karastan rug. It smelled brand new and looked nice and fresh, so we brought it inside the house and put it in the hallway. The bigger area rug, however, was a concern. Mr. Radar Nose The husband was certain that it still had a smell, but I couldn’t tell. We decided to place it inside our guest room and close the door, knowing that it would lock any sort of smell inside the room. We left it in there for a couple of hours and then went back to see if the smell was legit. When we returned, it did have a smell. The weird part was, it wasn't a bad smell. It smelled like we dumped a bunch of carpet cleaner on it, so you could really smell the chemicals we used. It didn't smell musty or have a pet odor, but it still had a distinct smell that was hard to pinpoint. 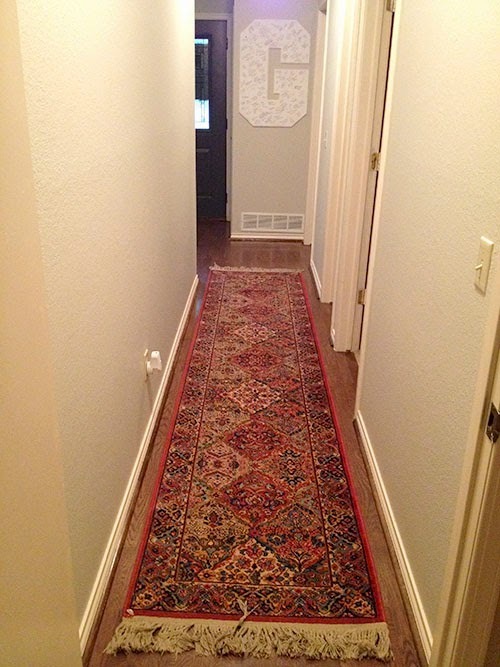 At this point, we're not sure what to do about the 8x10 rug. It's still sitting in our guest room. Does anyone have any other rug cleaning options we could try? I'm not ready to give up on it yet, but I'm also not ready to take it out of that room for fear of stinky problems later on. We'll probably end up re-donating it if we can't figure out another way to banish the smell. I'm taking all suggestions!